This very contemporary translation of a more rustic, organic mood is an artful solution to the desire for naturally-inspired design with a modern touch. It has been designed to fit a range of bathroom decors, but works particular well with out Aquatica Sophia freestanding solid surface bathtub. 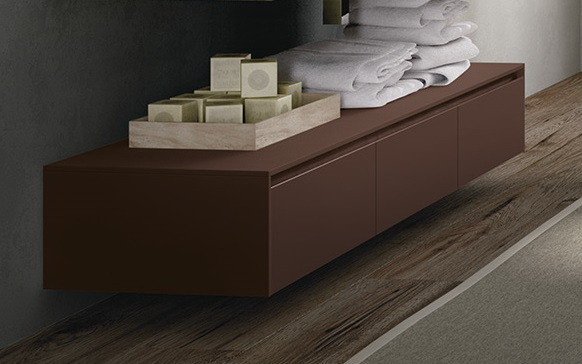 The components each feature key elements derived from our surroundings – the warmth of wood and rich earth tones redefined into bathroom fixtures which transcend conformity. The impressive countertop has been fashioned from natural oak, as if hewn straight out of a solid slab, its slightly irregular, bevelled edges the only concession to detailing. 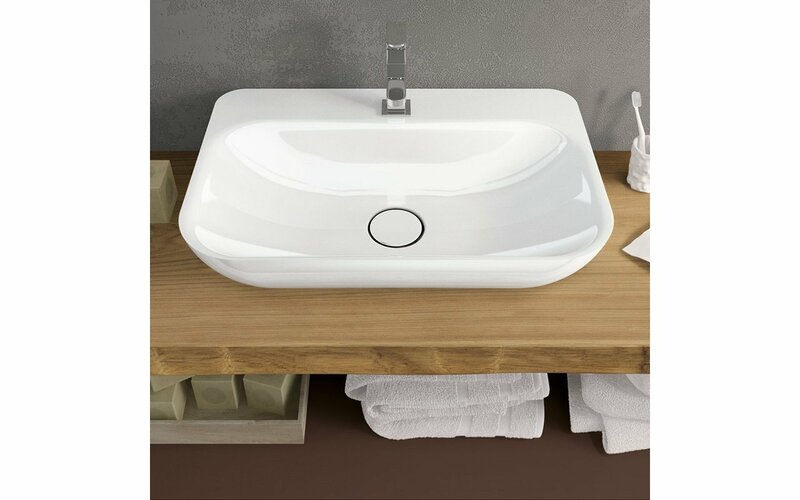 On this, sits the free-standing, gloss white ceramic wash basin, a clever combination of rectangular design and soft curved corners and basin bowl that is both modern and organic at the same time. 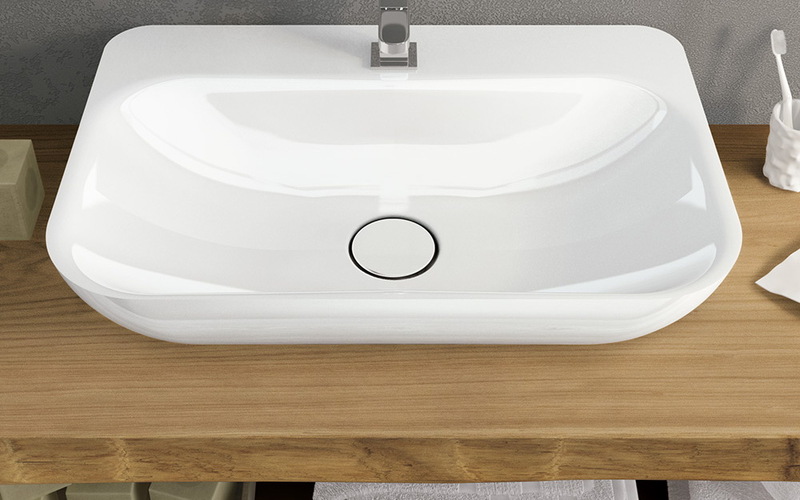 Ceramic vessel sink has been made in Italy and is available in a sleek, glossy white finish. Constructed using our elegant but strong and durable ceramic material of 1.6 cm thick. The stain resistant qualities and low surface moisture absorbency of this washbasin are functional and easy to clean. Beneath, the elegant and very useful, clip handle, 3-drawer cabinet, again striking in its simplicity of design and its rich, earth toned matt lacquer finish. The streamlined styling of this cabinet works in perfect harmony with the sink console providing generous storage in both the drawers and cabinet top. The lacquer finish ensures hard-wearing, easy clean, hygienic beauty. One of the most attractive features of the Aquatica Furniture Composition range is that you can choose from the large palate of colors in your choice of two materials from which to create your own personalized bathroom furniture to suit your mood and decor. 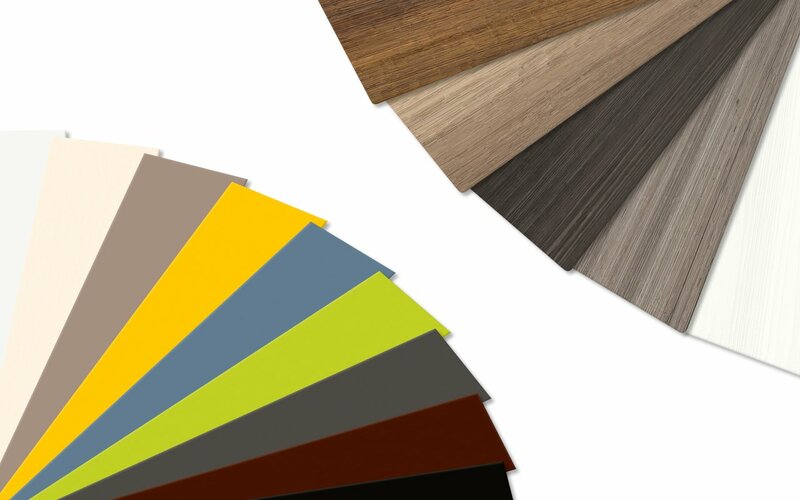 For a natural look, select any of five warm natural wood tone veneers for your master bathroom cabinets, shelves and drawers. Maybe it’s the smart, contemporary look of White Millennium or sophisticated Light Grey or Dark Brown you are looking for. Perhaps you prefer the rich golden timber hues of Honey Sherwood or Tobacco Sherwood. You can go bright and modern with a range of stunning lacquered colors which bring a playful tone to a children’s or teens bathroom or make a more dramatic statement in an adult bathroom with a real Wow factor. Here, you’re certainly spoilt for choice with colors spanning the full spectrum from White and Cream to Light, Mid or Dark Grey and Black, with Luscious Yellow, Orange, Coral, Red, Cobalt Blue, Pistacchio Green or Olive Green in between, in either smooth matt or high sheen gloss finish. Or you can combine both solid colors with softer wood grains, with matt and gloss finishes to create beautiful bathroom furniture that is uniquely you. With Aquatica’s bathroom furniture you really do have complete choice to make it you own. Apart from color and material, you can also choose the size of countertop and sink you would like. Simply select the base cabinetry and shelves you want to best fit your bathroom space and desired storage options, and both the countertop and size of the sink contained within that can be adjusted to fit accordingly. 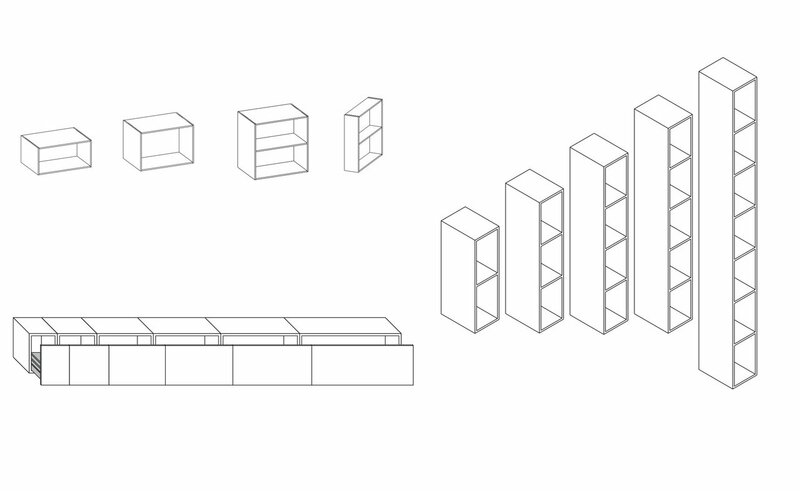 As both the base units and shelving options are extensive, you can create a truly customized bathroom furniture set. The only element which cannot be adapted size wise, is any of our ceramic sinks as these are all made to one pre-designated dimension. However you can choose the size of countertop in which to put your sink. As the Aquatica range of beauty baths continues to expand, so too does our selection of faucets, each reflecting the style, design and superior function that are cornerstone to our brand. The Italian-designed BO 220 delivers simple elegance in a single mount, waterfall style faucet. The Modul is not a just a trivial creative basin mixer with 1"1/4 Up & Down waste, but rather, a truly functional deck mounted faucet, designed for contemporary bathrooms. The slim geometric lines intersect with each other on a very precise note, in order to create the feel of architectural perfection.